Me, either, I tell him, save for last year’s Gravity Head kickoff at the NABC Pizzeria and Public House in New Albany. Begun 15 years ago as a celebration of high-alcohol (i.e. 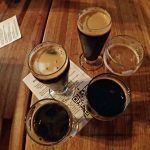 “high gravity”) beers, Gravity Head has grown into a month-long event where nearly six dozen, seriously potent brews (some from NABC, most from guest breweries) get top billing at the brewpub. Always held on a late February Friday, it used to begin at a more respectable time in the evening. But several years ago the start time got pushed back to 7 a.m., when Indiana allows restaurants to begin serving beer. When contemplating the menu for an upcoming beer dinner at Varanese, chef-owner John Varanese took an unconventional approach by tasting the beer first and then crafting a menu around it. And while that approach would make Homer Simpson proud, he said it just made the most sense. John Varanese, chef and owner of Varanese. “Beer’s food friendly anyway, so I knew that was a good place to start,” Varanese said. New Albanian Brewing Co. co-owner, Roger Baylor, came to the restaurant packing bottles and some handy food suggestions. Once the sipping began, the ideas flowed easily between them.